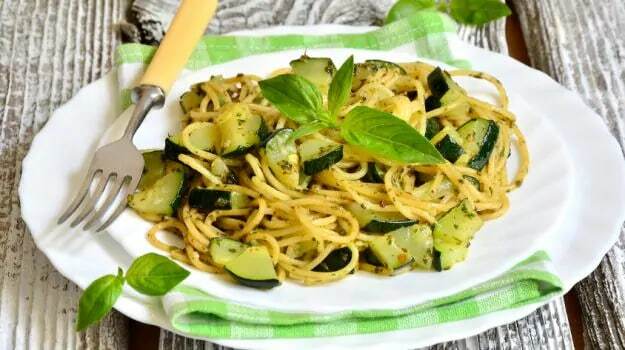 Yellow Squash Spaghetti Recipe : Thinly shredded yellow squash and bottle gourd, stirred in with green chilies, basil leaves and herbs, sprinkled with cheese. 1.Peel and thinly shred the outer layer of the yellow squash and bottle gourd so that it resembles spaghetti. 2.Add a pinch of salt to it. 4.Heat the pan, and add oil, butter, sage, thyme, green chilies and grated ginger. 5.Squeeze out the moisture from the squash and add it to the pan. 6.Give it a good stir and add basil leaves. 7.Garnish with grated parmesan cheese.